There are numerous great spirits in Native American folklore, one is of paint horse with blue eyes that the plainsmen refer to as ‘ Sunka Tanka’. Loosely translated it means the ‘Great Dog’. As can be imagined the Indian Plainsmen must have been in awe seeing this creature for the first time. That they managed to catch and train these animals to do their bidding was an enormous feat, and as time went on so a more symbiotic relationship emerged, and the horses became tokens of stature, with stories evolving of great escapades of the horses, and soon they became icons and were lifted up to spiritual status. There is a story of a great stallion that became a supernatural legend, and was endowed with special gifts bestowed on him by various animals. To see these animals running wild today encompasses the feeling of the wind and free spirit that so often people yearn for. 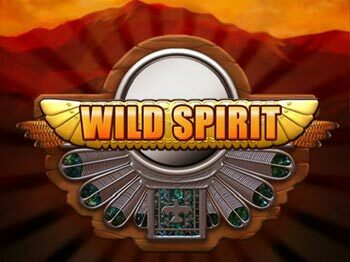 Wild Spirit is a five reel x 20 pay line video slot that features free spins bonus, scatter symbol, wild symbol and a gamble bonus at the end of every winning spin. The wild substitutes for all symbols except the scatter or bonus symbol. What type of slot is the Wild Spirit video slot? Coin sizes – 5c, 25c, 50c, 1.25, 2.5o, 5.00, 10, 25. What are the Wild Spirit pay lines? Maximum bonus – 8 x Multiplier.